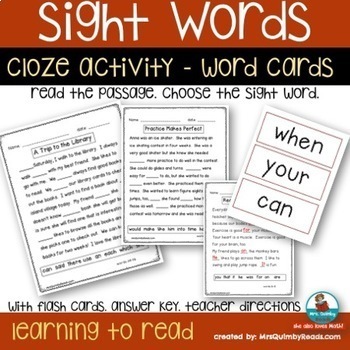 Teach sight words and provide practice with these cloze passages. Students read the text and choose the correct sight word from the word box. These pages encourage the reader to find the correct word by trial and error... you should hear lots of reading going on as they check and reread the passage to hear the meaning and if the word makes sense... my students love these and get better at cloze as they have more practice. The key is to read aloud or to a partner and listen to the passage after choosing the sight word. 5 literacy skills that make better readers are reading, thinking, writing, listening and speaking; and all 5 skills are practiced when solving these cloze activity passages. Flash cards are in two forms ...one for individual students to read, cut and work with on a daily routine. The others are for you to display in the classroom. These sight words are from Fry’s list...the first 100. 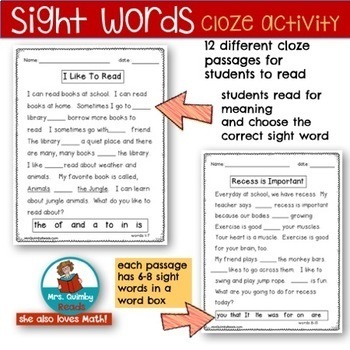 This cloze activity is good reinforcement and review for children to practice reading fluency and working with sight words they have already mastered. Working with a partner or small groups will provide an opportunity to listen and speak about these passages. Many of these text passages also are on important life skill topics ; i.e. recess is important, making friends, a trip to the library, practice makes perfect, being a good student. Students read to find the correct sight word that makes sense. Reading and rereading are important and improve reading achievement. Cloze activity has that 'solve a puzzle' attribute which creates high interest and motivation. Once your students start solving these cloze activities, they look for more! Students must read and reread for meaning. Mini sight word cards for student use; larger word cards for your pocket chart. These pages make an excellent morning reading activity, small group activity or send home in a folder to keep those children reading. When working on these cloze passages, children learn to listen to their own reading; they learn that reading sounds right and makes sense. Answer keys are included for quick correcting. 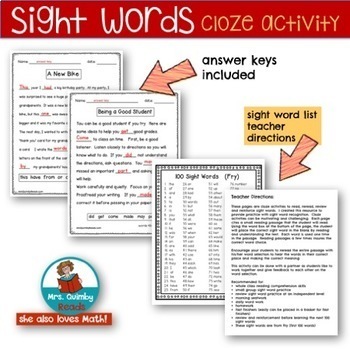 List of 100 sight words (Fry's List) and teacher directions are also included. And a final note: more text passages and more sight words will be added soon. Get yours at this low price and you will be able to get the updated version for FREE. And if you follow, you will receive notifications of new teaching resource listings, updates and sales. All new teacher resources are listed at 50% off all new teacher resource listings for the first 24 hours. Follow HERE to get these savings. Other sight word activities and pages can be found HERE.